"Once you realize God is imaginary, you lose interest in hearing what God thinks about things." - Christy Hoffman Wiegand (Free Inquiry magazine, Sept. 2016). God is imaginary, like all the other gods; products of the imagination open to unending and unresolvable interpretations. After all, anything goes. This explains why the nature of God, his thoughts and his commands, are interpreted in so many ways by so many faiths, sects, and individuals. It also explains why so many believers are upset at the indifference of unbelievers. It’s because cherished commitment to an imaginary god is taken to be a sign of virtue; therefore, such belief is threatened by pointing out that it’s only make believe. No one is interested in or cares about what Osiris, Thor, or Baal thinks about things. No has interest in, nor cares about, the thoughts and desires of Huitzilopochtli and Quetzalcoatl, though thousands of innocent lives were sacriﬁced to them. 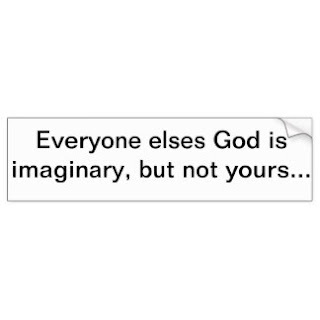 They're all imaginary. Of course. 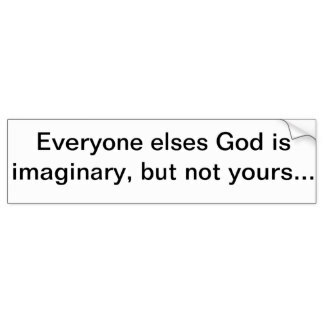 What would have happened if the Judaic/Christian/Islamic deity was added to the "imaginary" list? Would it have made any difference in history? Did rejecting of all the other imaginary gods make a difference? Imagine the persecution, the murdering, of those who didn't follow the dictates of those who spoke for gods or God. Imagine the lives sacriﬁced, slaughtered and lost in battles due to defending and believing in man-made products of the imagination. Mr. Hoffman Wiegand further writes of his church membership: "It seemed unimaginable that people wanted to continue to waste time listening to each other deﬁne God. It was equivalent to listening to someone ramble on about the dream he or she had the night before." Well stated, Mr. Wiegand. I would like to tell him it isn't unimaginable. They, like all believers in imaginary gods (including their God), and their/his thoughts and what they/he wants from them, are not noticing the ones behind the curtain, the puppeteers pulling on their heart-strings, goading their fears and hopes, thanking them for their money for all this information, etc. No one is interested in or cares about what Osiris, Thor, or Baal thinks about things.So let's begin by being honest and dump all discussions of theology since they are based on imaginary beings and realms. Why waste our time refuting theology and getting caught in its web? There can be no end to discussing what Daffy Duck would do with inﬁnite power. Discussing the nature and power of God is no different. Sure, theology has entertainment value. (So do terrorist attacks; just ask the media). We can create our own gods at will, or just as easily discuss the personalities, thoughts, and even demands of Daffy Duck, Spiderman, Wonder Woman, etc. There's one difference, though: nobody suffers and dies for denying their existences. (But, if theologians gain over, they just might). Why should there be objections to mocking the existence of the imaginary God? Why doesn’t their god come out of the closet and show himself? Misery and unremitting horrible violations of human rights are ongoing, simply because people are submitting to the salespeople who have sold them an imaginary being with his imaginary demands on mankind. Shift your focus. Turn the spotlight of reason and honesty and shine that light on the manipulators of God talk. How and why are they getting away with using people for their own ends? And why are people allowing them to do so?